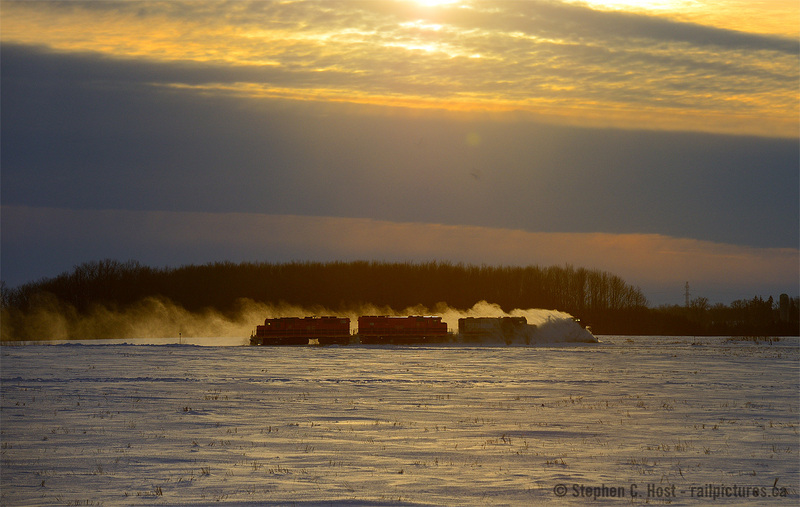 Railpictures.ca - Stephen C. Host Photo: In the wake of snow kicked up by the plow, a trio of geeps are seen as a silhouette. The battle against mother nature never really ends up in Stratford, not until temperatures rise above zero in the Spring. In deference to mother natures strong will, GEXR crews head into the sunset with 6750 horsepower and a plow, destination Goderich. | Railpictures.ca – Canadian Railway Photography – photographie ferroviaire Canadienne. Caption: In the wake of snow kicked up by the plow, a trio of geeps are seen as a silhouette. The winter battle never really ends up in Stratford, not until temperatures rise above zero in the Spring. In deference to mother natures strong will, GEXR crews head into the sunset with 6750 horsepower and a plow, destination Goderich. I goofed the date! Sorry, should be 2015. “Pleased”??? Is that all?? You should be yelling “Yahoo” to the Heavens while you breakdance. Thank you. I’m pleased how it turned out. Another great one Stephen good job.